When Archie vs. Predator was first announced last year, it took much of the comic book world by storm. The fusion of these two franchises, seemingly worlds apart in style and subject matter, threw many a reader for a loop as the innocent and wholesome characters of the Archie universe got torn to shreds and then some. The writer behind the miniseries, Alex de Campi, knew that the extreme violence would be par for the course in this case, and after some musings on how our corner of the show floor smelt of stale popcorn, she started into an explanation of how the series came to be. de Campi wasn’t afraid to crank up the violence – and neither was Archie. As development got underway, neither de Campi nor Archie expected the fan and media firestorm that followed its public reveal. “We thought it was really just this low-key thing,” she explained, “that wouldn’t be a big deal at all.” Archie gave her the freedom to dial up the gore and violence as she saw fit, a creative freedom she deeply appreciated. Planning and writing commenced, and the big reveal of the miniseries at last year’s New York Comic Con generated more buzz than anyone expected. “We had no idea, until it got announced, that it would be anything other than this little project we were doing.” she said. Despite all of the hype and fanfare, de Campi encountered very little interference from the powers-that-be as she and artist Fernando Ruiz brought the miniseries to life. She explained that Archie provided nothing but the strongest support they could offer, and Fox’s content notes proved minimally invasive. She recalled how the company let several things go that she expected to get the axe – the inclusion of emoji in the Predator’s heads-up display, for example. On the whole, she ran into very few creative or professional difficulties that she couldn’t resolve quickly, and the project’s development cruised along smoothly. Unlike Archie’s Spring Break vacation, production of the miniseries went fairly smoothly. Reconciling the two franchises took some special care, however. de Campi went to great lengths to ensure that characters from both the Archie and Predator worlds behaved as we would expect them to. Part of the challenge, she said, was keeping the characters’ actions and dialogue in line with their established backstories, relationships, and universes. Aside from that, she felt that the two worlds fit together much more naturally than most people would think. She likened the crossover to a tongue-in-cheek slasher like Friday the 13th or Shaun of the Dead – a bunch of teenagers happen upon a dangerous situation and get mutilated in all sorts of ways. 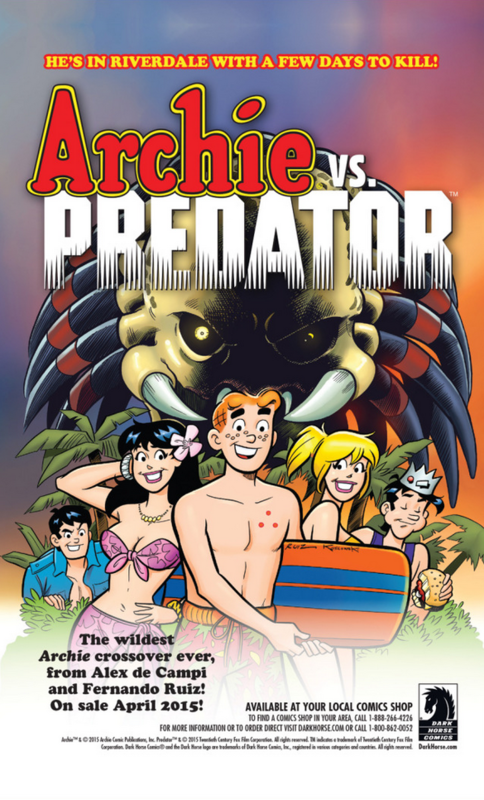 Once she cracked how to fuse the two worlds successfully, the rest (as they say) was history, and she eventually realized the project as one of Archie’s wildest crossovers ever. If you haven’t read them, all four issues of Archie vs. Predator are available now from Dark Horse Comics. We thank Alex for taking time out to passionately relive the creation of the miniseries!